A Cool Memory Foam Mattress at a Cool Price! All over my website you will find references to how much you can spend on a memory foam mattress, but if you’re new to this type of technology, it might surprise you to know that just one mattress can set you back several thousands of dollars! This was part of the reason I started the review site you see before you today. I’m a firm believer that you don’t have to take out a loan just to pay for a mattress, so I decided to pick a few affordable alternatives that will help support you where you need it most, resulting in a comfortable night’s sleep without interruption because of those aches and pains. I would also hazard a guess that if you are aware of memory foam mattresses and their benefits, you’ve decided to check this review out because you’re concerned about the amount of heat they can produce. Well, I think I might have the answer in the form of the 12 Inch LUCID by Linenspa. So first off, the construction of this mattress goes like this: Two inches of gel memory foam at the top for added comfort, two inches of support foam beneath that and finally you have eight inches of high density foam at the bottom. If you’re interested in density, you should know the gel foam is 4lbs and the comfort foam layer is 3lbs. 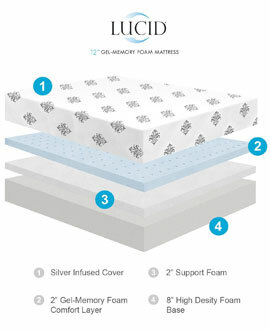 What’s great about this mattress is it uses a slightly different “gel” technology to some other brands. This one has gel infused beads which makes it easier for heat to be captured and distributed around the mattress so it doesn’t all stay in one place. The gel infused beads and the ventilation foam work in tandem not just to stop heat from becoming an issue when you sleep, but it also allows the bed to soften quicker. This means you won’t get that initial firm feel when you lie on it because the foam contours to your body faster. It also uses something called “open cell” memory foam which helps with increased air flow as well as avoiding those unwanted dents many people suffer from with this type of mattress. Some people may find this memory foam mattress a little too soft though, simply because of the way it’s designed, so bear this in mind if you like a really firm bed beneath you (in which case I would recommend this mattress). Of course, you will be interested in what sizes are available and I won’t disappoint with this one. You can buy this mattress in Twin, Full, Queen, King, California King and Twin XL so whatever size you are, there should be a model to suit. The LUCID does come with a protective cover, and the manufacturer has thought beyond the realms of standard hygiene. What they have done (which I think is pretty clever) is made it from a mix of polyester and cotton and here’s the best bit; it’s infused with silver! Just in case you don’t know, silver is well known for its anti-microbial properties and will also help prevent bacteria and viruses from forming within the mattress. This makes for a much cleaner surface to sleep on, and the cover will withstand the test of time better. The whole mattress (cover included) is Certi-PUR approved so you can be rest assured that even during the 72 hour expansion process any odors you get are not harmful to your health, and all the materials used are environmentally friendly. Oh, and you also benefit from a 25 year limited warranty. If this sounds like the memory foam mattress you’ve been looking for, why not take a look at Amazon? I mentioned at the beginning of this review that you can spend thousands of dollars on a memory foam mattress but this one won’t set you back anywhere near that much!